Download the SOS Brochure, a helpful, easy-to-read guide for using our online system. This system is available to all Undergraduate and Post-Graduate students in all faculties. 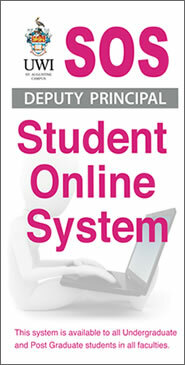 Want to know if your Student Matter qualifies to be entered into the Deputy Principal's Student Online System? Did I take my concern to the relevant presonnel for resolution? Example, Faculty Deputy Dean (Student Matters), Head of Department or Administrative Assistant or personnel in Administration responsible for the specific matter? If all efforts to resolve your issue using all avenues are exhausted ONLY then you should use the Deputy Principal's Student Online System (SOS). How do I apply for the services offered through SOS? Will I have to submit any additional documents? How will I know if my student matter is received by the Deputy Principal? Once your request/concern is submitted, a confirmation email will be sent to your official UWI student email with a tracking number. How do I track my request/concern? How will I be notified of the final decision of my student matter? All updates will be communicated to applicants via their official UWI student email. Based on the nature of the issue, students may also be contacted by official University correspondence or telephone. Once submitted, you will receive an automatic email response. Who can I contact for more information on the Student Online System? Please contact the Administrative Assistant - Student Matters at the Deputy Principal's Office (662-2002 Ext. 84317) or email deputy.principal@sta.uwi.edu. © 2004 - 2017 http://sta.uwi.edu. All Rights Reserved.